One month from today is the first-ever Rebecca’s Boardwalk, a fundraiser in support of Rebecca’s Gift. It’s a family-friendly afternoon of carnival games with actual prizes to be won, a facepaint and temporary tattoo booth (many thanks to Tattly for their generous support! ), indoor mini-golf and bounce houses, boardwalk food, and a pretty great silent auction. We’ll have everything from gift-card grab bags to artisanal meat parties to signed shooting scripts from The Walking Dead up for bid! All of the proceeds will go to fund the mission of Rebecca’s Gift, which is to provide healing family vacations after the death of a child. The organization has already raised enough to assist at least two families in 2016. We’d very much appreciate your support in helping us lend a helping hand to more families in desperate need of time to reconnect, rebuild, and relax. It’s one of the very few organizations we know of that supports families after a child’s death, as opposed to before. This is something I touched on in a piece I wrote for Natural Papa back in September, in conjunction with St. Baldrick’s. It’s something Kat and our friend Karla are determined to do something about, and I’m honored to support their efforts. I very much hope you can join us for Rebecca’s Boardwalk, or if not, support the event via a sponsorship. 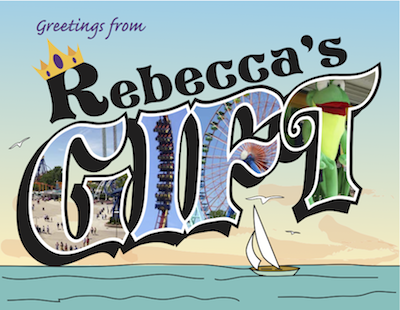 Rebecca loved travel and boardwalks in particular, and we can’t think of a better way to celebrate her life while striving to help others heal as best we can.